Minister of Power, Works and Housing, Babatunde Fashola (SAN) has said that the inadequate electricity supply rocking the country “would take a little more time”. 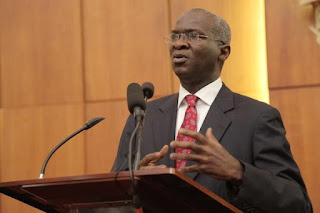 In an interview monitored by Greennews.ng, Fashola likened the country’s electricity power source to the popular Generator set which wouldn’t work without petrol or diesel. He affirmed that Nigeria’s power source needed fuel which the county lacks, to produce regular power supply. According to Fashola, most of the Gases produced in Nigeria are technically termed as associated Gas. The Minister Said: “Producing power is not different from the Generators that you have at home, they are only bigger. So they need fuel. Today most of the fuel source for our power out of about 25 power plants that we have, 20 are filled with Gas. “Most of the gas that is produced in Nigeria today is what is termed technically as associated gas. That is Gas produced when we are producing crude oil. So we need to have constant fuel to power those Generators. And then we can begin to talk about generation of power. Fashola further stated that, “This is a difficult time that we are all going through and its happening in the midst of an energy crisis. Nobody could have wished this at all – fuel shortages that people can’t even power their alternative sources if the public power source is failing. “We are working very hard, my colleagues and me under the leadership of the President and vice President. We are doing everything humanly possible. It would take a little more time. But I am sure that there will be glorious done at the end of all of these”.